Posts: 16 Quote Reply Topic: Montana recommendations? I prefer 'Elizabeth', 'Fragrant Spring', montana var. wilsonii, montana var. grandiflora because these are fragrant. 'Marjorie' as flower and the old montana var. rubens 'Tetrarose'. 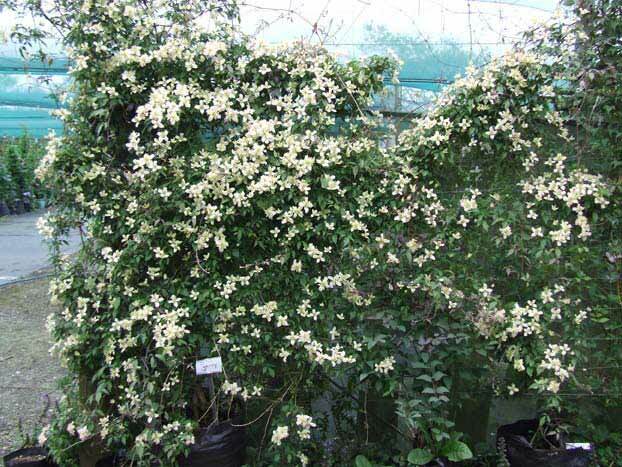 Hi, I agree with Tons reccommendations, but would add "Mayleen" to your list, after a visit to Thorncroft Clematis Nursery today, this was the montana that seemed to have the strongest and most pleasant scent. 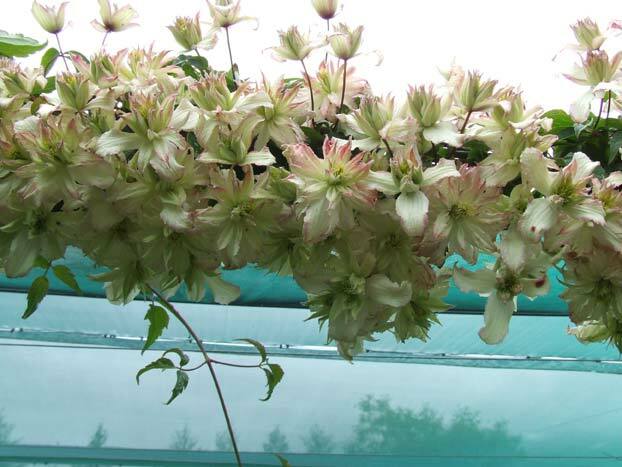 I agree also with Ton and Roy, Clematis 'Mayleen' is one of the best Montana Group cultivars. 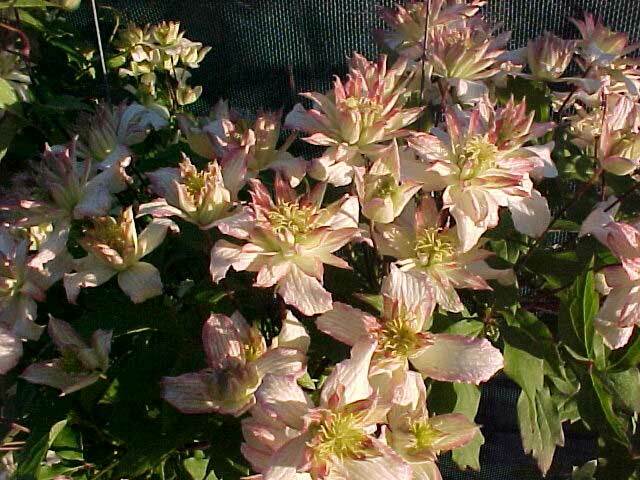 My best advice is that when you want to buy a Montana Group cultivar you better do it now as the plants are in flower. Then you see what you buy. Has 2 flowers on a 2 year old plant and then it dies. The best double, pink Montana Group cultivar but no scent. Not realy hardy. In a cold greenhouse the plant flowers from May into November, nice scent, but for the garden outside I do not know, better buy a cultivar known to be fully hardy. Very floriferous and nice scent but flowers are "small" and a bit pale in colour. Very good scent and large flower (up to 8 cm across) but not so floriferous compared with the similar Clematis 'Vera'. Very hard to find true to name plants, hence my opening advice. Is like a white 'Mayleen' and one of the best. Very floriferous and scent. Compared with 'Montana Grandiflora' smaller flowers but still better. Nice contrast with the dark foliage too. What a plant that is, again one of the best however the flowers are a bit "small". Dark flower colour and dark foliage. Rumours go that this is "the" or at least "similar" to the plant introduced as 'Montana Rubens' by Wilson. No personal experience here but I took the picture at the NCCPG Montana Group. The plant grew under a tree so in full sun no doubt a better colour. Similar in flower shape as 'Tetrarose' and 'Sir Eric Savill. Difficult to grow and not so many flowers. For a double one it is probably the only one that has a bit of scent. However the picture show quite double flowers I have never liked the plant personally. Difficult to grow too. Better coloured outside in full sun, this picture was taken in the greenhouse. No scent as a double one is but very floriferous. As with 'Sunrise' I still like 'Broughton Star' better. What a plant 'Mayleen' is. If you have room for only 1 Montana, go for 'Mayleen'. Strong grower, very floriferous, scented, good pink colour, what else do you want? Very easy to recognise by it "square" flower shape and in full sun there is a kind of gold twinkling over the tepals that no other Montana has. Better known as Clematis montana 'Grandiflora' or Clematis montana var. grandiflora. Several different forms are grown on whatever name. We still grow the stock that originally came, via Jan Fopma, from Raymond Evison. Raymond introduced the plant under the name Clematis chrysocoma var. sericea and this name is still going around too. Later Raymond publised himself that the plant is 'Grandiflora' and I fully agreed with him, better written today as 'Montana Grandiflora'. So, not *** because of the different forms offered but ** instead. To many different forms are grown simply because of seed propagation in the past. But when you buy now as the plants are in flower you can still pick a good form. A "good form" should have "small" flowers, is very floriferous, "round" flower shape and a good scent. Very good white too like 'Montana Grandiflora'. The main reason why the plant does not get my *** is that when in full flower there are already a lot of young shoots that hide a flowers just a bit to much in my view. Despite the fact that Dr John Howells solved the nomenclature problem around this plant we still maintain the name as written here. Probably has the best scent of all montana's and a bonus is that it flowers later then "the rest". But a bit difficult to grown and not so floriferous as the other whites. Let's not start on the invalid name but the plant is very floriferous and with a strong scent. "Small" flowers though hence the two ** and not ***. What a perfect flower that always is, very easy to recognise, you just have to love the shape. But, too "small" and not so floriferous. The 3 *** does, as it should be, only count for the true to name plant. Very easy to recognize for its "square" flower shape and the pink tepals with the white edge. But most stock on this planet is something else, so again, hence my opening advice. Nice scent and very floriferous. Let us not start with the invalid name and I do not like when there are to many single flowers. No scent too. Nice double flowers which are reasonble sized. No scent but much better then the other double whites. Another 3 *** white, the other one is 'Elten'. However 'Prosperity' is probably not that hardy still one of the best. Extremely floriferous, good white colour and scented. Go for it. I guess the pictures speakes from themselves. What a plant that is. It is a pity I do not give 10 stars. Big flowers, extremely floriferous and scented, go for it. Another very good double pink, like 'Broughton Star', but one way or the other I still like 'Broughton Star' better. Dark foliage, double pink flowers and, as a double one is; no scent. Enourmous flowers, scent and very nice foliage but only 1 * simply because the plant is too difficult to grow. If you like the shape, choose 'Sir Eric Savill'. We have our stock from a reliable source via Dr John Howells. However the flowers are too small, still 3 *** because, when you have seen this in real live, you simply get weaky legs [I am not sure if I should write this, but as you see, I did not delete the words]. Immistacable pink colour, not find in any other Montana Group cultivar and a perfect flower shape. Scented to but not so strong. Very similar to 'Elizabeth' but more floriferous. A very floriferous plant but I have never liked it. "Small" flowers and depending probably on temperature, the colour can be ugly stained. There are many more Montana Group Cultivars but I hope this is a nice overview. Good luck with choosing your Montana. Yes Wim it is. 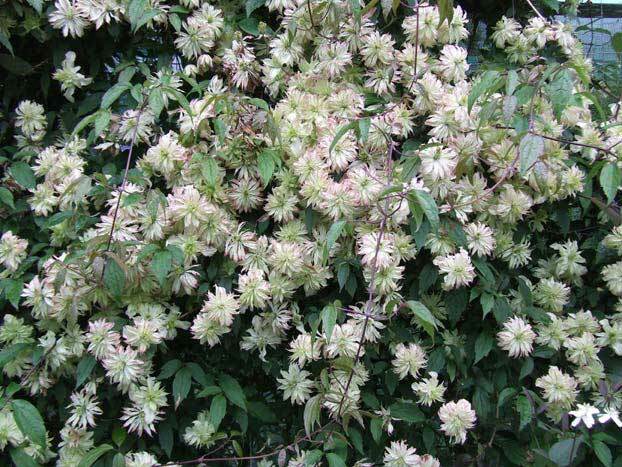 What you say about buying montana when they are in flower is the same as I told the people in my lectures about Clematis. Thank you everyone and particularly to Wim for a such comprehensive response. Yet again I find there are too many clematis I want and not enough garden space. in my garden , all grown from seed , they are all nearly twenty years old . at times thows double flowerer's , I had six plants but I planted one to near a Yew tree , which seems to kill off any thing planted under it . I am expecting at least one plant to be in bloom the weekend . Which ever you chose keep[ it under control , or the flowers could be out of reach to appreciate any scent they may have . They can be cut back with not a lot of harm done . I took this picture yesterday somewhere in the town I live. 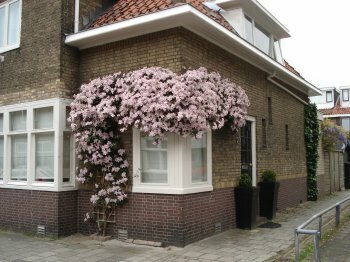 As you see, Clematis 'Mayleen' in full flower on a house in typical Dutch 1930's style. It's our best performer flowering for 5 weeks (most montanas give one week) and the most compact 3x3m. in 10 years. I agree with Wim, it is not a good plant, possibly our climate does not agree with it. The minus 5 deg C. we had in mid May seems to have finished off my plant, as all green growth and flowers are now crispy brown, with all stems apearing to be dead. Five other montana types in the vicinity were unaffected and continued to produce flowers and new growth. Sounds like one plant that is best left to grow in New Zealand. I prefer my montanas to be single and scented anyway. For years I had a plant in the garden and sometimes 5 or less flowers so I digged up the plant. Not worth to have! AS said before, Cl. 'Jenny' is by far the best Double Montana we can have, so it may not be worth for you to have, climate may well be a reason, the other thing is the Cl. 'Jenny' in Europa/UK may be out of a unhealthy version of the clone. About one of Wim's favorites Cl. 'Broughton Star' we find it difficult and extremely prone to Phythoptora (root rot), and have not seen a plants older than 2-3 years here in our area. We are a bit wet at times the June rainfall to date are 184mm! Those pictures sure are quite impressive, thanks for sharing them. Quite right to introduce a plant like that. But one way or the other, I think it will be a very good subject to study why some New Zealand Montana Group cultivars are not doing so well in Europe or perhaps even the Nothern Hemisphere and why some European Montana Group cultivars are not doing well in New Zealand. Sometimes plants weakened somehow are distributed (with a sort of hidden poor resistance to a disease) and never perform as plants, we do see it a lot in Strawberry plants. The first time I did really observed this was back in the late seventies with Rhododendron, it was the cultivar Rh. 'Chikor', you could root them and grow them for a short time and they would all succumb to Phytopthora, and after a year or two 50% will be dead another year and another 50% of them will die and on the third to fifth year they will all be gone. I had sourced plants direct from Scotland (the breeder) and they all went so did the plants from two other sources, and I did give up on growing Rh. 'Chikor', one spring I went to Denmark for getting interesting stuff from Vagn Sondergaard, Herning and he had lots of Rh. 'Chikor' nicely grown 5 years plants (he had never had any succumb to Phytopthora) and he guaranteed the survival of the plants or money back, so I got 100 plants, I never lost any of those to Phytopthora and nor did any of my customers. Some nurserymen sorting hard in their stock other just propagate whatever weak or strong material, making no check for viability.